bebop spoken here: Swing Manouche @ Dormans Jazz Club, Middlesbrough - Sept. 6. Swing Manouche @ Dormans Jazz Club, Middlesbrough - Sept. 6. Mick Shoulder (Guitar); Giles Strong (guitar); Paul Grainger (double bass); Gavin Lee (clarinet). It was a pleasure to have Swing Manouche as this month’s guest band and to witness a fine performance of Hot Club Style Jazz. The night began with a nice version of Lulu Swing followed by Douce Ambiance with the four musicians clearly showing the passion they held for the genre and their ability to play so well together. Gavin played a fine melody to Mick's composition My Quiet Place (Mon Endroit Tranquille). Valse à Gonzo, a lovely Jazz Waltz, was another piece composed by Mick inspired after a face to face meeting with Giles’ dog. The night continued with classic Django style playing including, amongst others, the numbers Joseph Joseph; Minor Swing; Dinette; Nuages; Hungaria and Them There Eyes; featuring Gavin and, for an encore, a fine swinging rendition of Noto Swing. Hubert Rostaing who featured on several of Django Reinhardt’s post-Grappelli recordings. 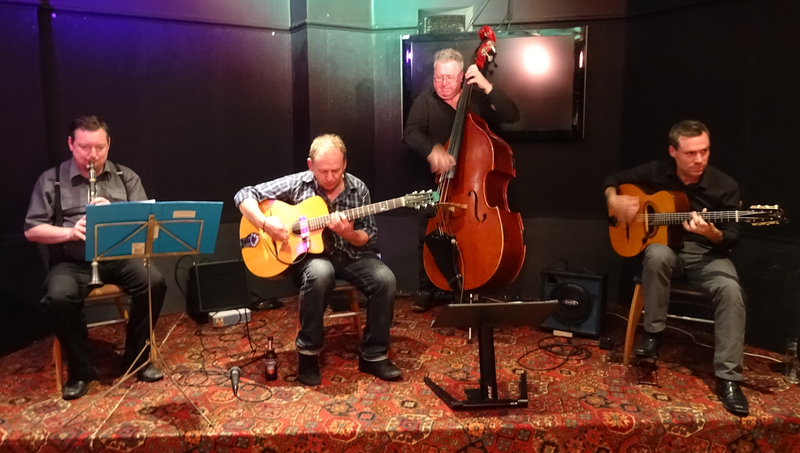 With bassist Paul Grainger providing fine support it made for a first class night of Gypsy Jazz at Dormans.